MotoGP testing recommences in Spain ahead of 2019. 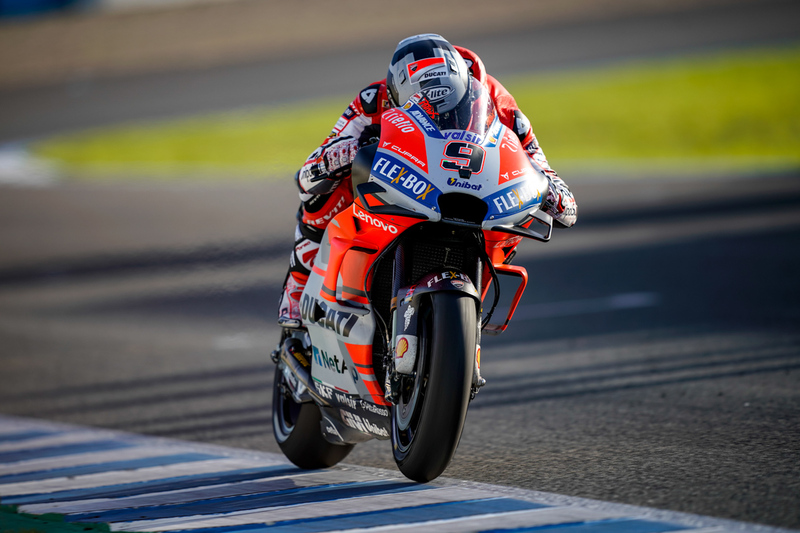 Danilo Petrucci (Ducati Team) topped the timesheets on day one at the Jerez MotoGP test after setting a 1m37.968s in the afternoon, heading teammate Andrea Dovizioso – the 04 Italian crashing at turn five late in the day – by 0.217s, with Takaaki Nakagami (LCR Honda Idemitsu) having a very positive opening day to finish P3 on the timesheets. A cold morning in southern Spain meant the track action didn’t get going until 11:30am local time, but conditions soon improved in the afternoon as the premier class riders continued their crucial 2019 preparations under sunny skies in Jerez. By the half way mark it was Repsol Honda Team’s Jorge Lorenzo heading the pack, but times would tumble further – and Petrucci would emerge fastest. At Ducati, Petrucci completed 53 laps on Wednesday to be the only rider to dip below the 1m38s bracket. Both he and Dovizioso had a 2018 spec and 2019 spec bike to compare on the opening day in Jerez, but according to team manager Davide Tardozzi, both riders soon switched to the 2019 Desmosedici. On his last run, however, Dovizioso crashed at turn five to end his day prematurely, although he was ok and had already managed to get 53 laps in as he and Ducati concentrated on electronics, chassis and the engine. 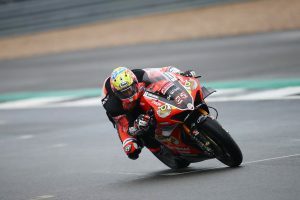 The returning Alvaro Bautista – the Spaniard replacing injured test rider Michele Pirro – had a full 2019 spec at his disposal, with the Aruba.it Racing – Ducati WorldSBK rider ending the day ninth on the timesheets. 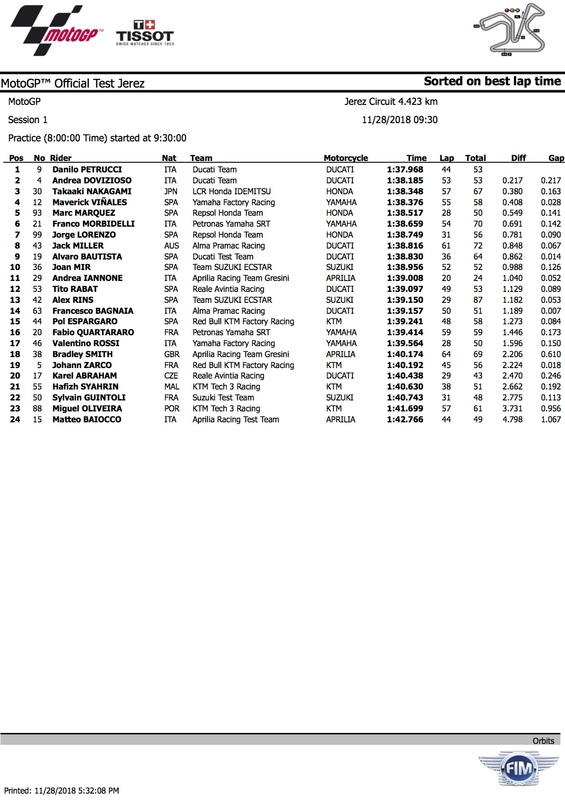 Just ahead of him was Jack Miller (Alma Pramac Racing) in P8, the Australian on a part-2018 and part-2019 Desmosedici for the time being as he worked on the geometry. Miller’s rookie teammate Francesco Bagnaia (Alma Pramac Racing) had another good day on track and was 14th fastest on day one. The reigning Moto2 Champion has the 2018 Ducati available to him and he completed another 51 laps, finishing 1.189s off Petrucci. Bagnaia described Jerez as a ‘more difficult’ track than Valencia to rider a premier class machine, but he also confirmed he’s progressing in the right way. Reigning World Champion Marc Marquez (Repsol Honda Team) wasn’t far off, though. The second fastest Honda after the first day of action, the Spaniard ended Wednesday P5 on the timesheets. According to team manager Alberto Puig, the bikes were the same as they had in Valencia as the Japanese factory continue to mix parts in order to find the best combination to take to Japan. Marquez ended the day 0.549s from the top after completing a half-century of laps, while also sporting a new aero package on the front of his Honda. New teammate Lorenzo, who led in the morning for a time, was seventh fastest on his third day riding a Honda. The Spaniard set a quickest time of 1m38.749s to finish 0.781s off Petrucci after getting another 56 laps under his belt. Lorenzo is still not 100 percent fit, adding to the challenge of adaptation from the Ducati. At Yamaha, work continued on the engine. Maverick Vinales (Yamaha Factory Racing) was a threat at the top throughout the day and put in 58 laps before the end of play – with the number 12 finishing up just over four tenths off the top in P4. He said they were working on race pace, but also said they’re not yet sure about one of the two different spec engines they’re testing – with more work to do on Thursday. Teammate Valentino Rossi was a later presence pitting out, but the number 46 put in 50 laps on Wednesday once out on track. He ended the day just over a second off Vinales, in P17, but didn’t put in new tyres. He also suffered a technical problem that brought one run to a halt, with Rossi pulling off track after hearing a problem in his M1. Petronas Yamaha SRT, meanwhile, had another solid day. Franco Morbidelli was sixth overall after 70 laps and a best of 1:38.659, and rookie teammate Fabio Quartararo ended the day in sixteenth. The Frenchman’s best was a 1m39.414s as he continues settling into the premier class. Joan Mir (Team Suzuki Ecstar) was another entering a new era who impressed – and he was the fastest rookie. He led the way for Suzuki in Jerez to finish the day tenth on the timesheets, although, the 2017 Moto3 World Champion suffered his first MotoGP crash after going down at turn seven just after 13:00 local time. The Spaniard was ok and headed back out later in the day to improve – a hot 1m38.956s his best time, putting him under a second from the top. His teammate Alex Rins, alongside test rider Sylvain Guintoli, had a lot of new parts to try on Wednesday. The new engine and the chassis has been the main focus for the Hamamatsu factory, with the new engine more powerful than last season’s. According to team manager Davide Brivio, Rins was on an aluminium chassis, while Guintoli was testing a carbon-based chassis – with Brivio also confirming the plan is to build an aluminium chassis that has the same stiffness as the carbon one. Rins ended the day P13 on the timesheets after completing 87 laps – the most of any rider – while the Guintoli was P22. At Aprilia, the test got off to a tough start as Aleix Espargaro missed day one through illness – although he’s hoping to ride on Thursday – but new signing Andrea Iannone put the Noale factory in P11 overall with a 1m39.008s. He was only able to complete 24 laps, however, then sitting out the rest of the session after a crash. Test rider and new arrival Bradley Smith, meanwhile, did 69 laps. 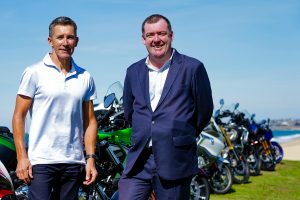 He was working with Aleix Espargaro’s bikes, with a new spec engine focused on power delivery and torque, and each Aprilia rider had two chassis to compare. CIV Superbike superstar Matteo Baiocco was also on track for the Noale factory, and he did 49 laps. Finally, for KTM, it was all hands on deck as the Austrian factory look forward after a more difficult 2018 – Valencia notwithstanding – and they had six bikes in the garage. The Red Bull KTM Factory Racing rider was the lead Orange machine on day one in Jerez too, in P15 with a best of 1m39.241s after 58 laps. New teammate Johann Zarco was in P19, but the focus? Development and definitely not the timesheets. KTM are working on a huge list – seamless gearbox, chassis parts, aerodynamic parts, a slightly different engine…and they’re using the new IMU. Their two Independent Team riders at Red Bull KTM Tech 3, meanwhile, were working on the best bike from 2018 – although they’re expected to receive an update in Sepang. Hafizh Syahrin did 51 laps with a best of 1m40.630s and rookie Miguel Oliveira put in 61 laps, ending the day around a second off his more experienced teammate. Testing resumes tomorrow.